It’s official! 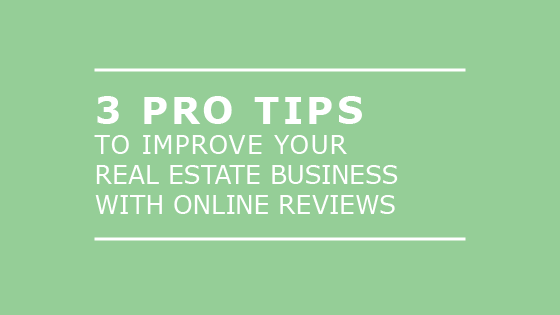 We’ve hit Spring: AKA the busiest season for real estate professionals… and in lieu of that, we’ve come up with three easy ways for you to collect those important reviews in the midst of all action. So, to start things off, why do you need to request reviews? Simply put, reviews are a way for you to reinforce your positive reputation to others online. Studies show that 92% of consumers read online reviews as much as personal recommendations. This is no different for real estate professionals. We consider online reviews your online resume to showcase your work to the public and re-confirm the word of mouth online. Also, reviews get noticed on Search Results, helping you build trust and attracting more people to your business. So, what do people look for when they read reviews online? According to a recent Brightlocal study, the most important factors are: the overall star ratings (58%), sentiments of the reviews (47%) and the recency (i.e. age) of reviews (41%). Given these factors, it’s critical for you to make online review collection a part of your sales-cycle. One – Hit the big yellow button! Studies show that 7 out of 10 consumers will leave a review for a business if they're asked to. At RankMyAgent, we’ve made it as easy as possible to ask your clients for those all important reviews. 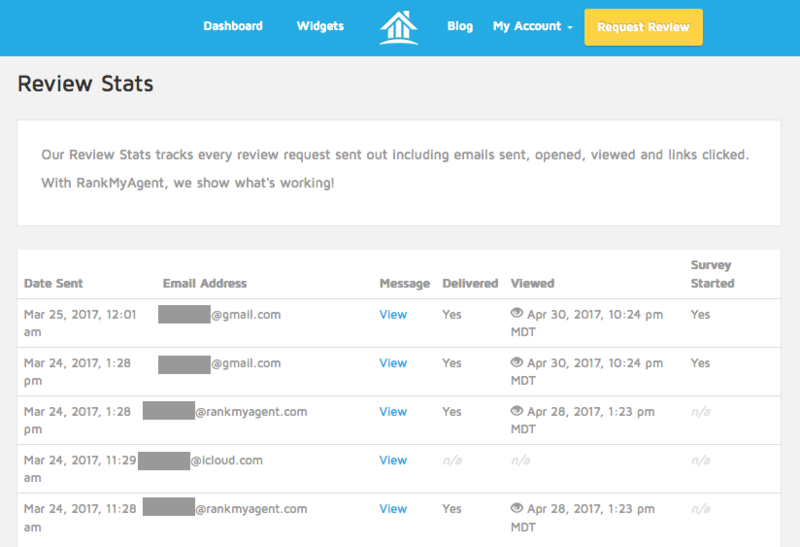 Log into your RankMyAgent account, and hit the big, yellow button that says “Request Reviews”, enter your recipients, edit the template (if you wish! ), and press send. Voila! You’ve sent off that review request in less time than it takes to get a cup of coffee. You can even monitor survey open rates by using our handy analytics, helping you with follow ups. Two – Take advantage of our free Reminder Cards. Hand it out, put it in your thank you gifts, pop it in a thank-you card… the possibilities are endless and simple. These cards ask your clients to take a second and write about their experience with you, along with instructions on how to do so. Interested? Email us at support@rankmyagent.com and we’ll be sure to send you some, on the house. Three – Build this into your system. The amazing thing about reviews is that they are a one-time setup, and then they’re there forever. If you build the latter steps into your system, it’ll no longer feel like you’re nagging at your clients. Think about it, how many times have you received a “How did we do today?” on your restaurant bill, or asked for a review from Amazon? You already know that word of mouth is a huge determining factor in gaining new clients – you also know that being online is as equally important – take your reviews from word of mouth to online and see your business grow. Make your profile a part of your marketing collateral: use our materials and place it across your social media, web pages, newsletters and email signatures (anywhere you’d like your profile to be seen, you can place your profile/icon). Here is access to the RankMyAgent Collateral. You can also use our widgets reputation marketing. Here are instructions on how to embed widgets onto your websites. No Surprises: during your weekly check-ups, ask your clients how you’re doing in regards to their expectations. Let them know that they’ll be receiving a review request at the end so it isn’t a surprise. Remember, happy clients are your champions and would be more than willing to write a review for you. Start talking about reviews from day 1 when the listing is signed. Ending off on a high-note: the best time to send these reviews is right after the firming or closing of the transaction deal. The experience is still fresh in your clients’ mind(s) and so the quality of the review increases! The more detail in a review, the better for future client to determine and assess whether they would like to work with you. In a nutshell: get visible and utilize reviews in your marketing, make sure you communicate with your clients about the review during the transaction, and then upon the firm/close of the deal, ask for the review! It’s that easy! New to RankMyAgent? Set-up your complimentary one-on-one coaching-call to give you a head start in managing your online reputation.